Like many others, before me, I became more aware of the Clownfish through the wonderful world of Disney and their creation of the film ‘Finding Nemo’. Seeing Nemo’s bright vibrant colors and waggling little bum really made me fall in love! Go on, you can admit it, I bet you did too? On further research, I discovered there are actually many varieties of Clownfish, in fact around 28. These include the highly desired, prized and fairly rare Picasso Clownfish (Amphiprion Percula) variety which on sight I instantly had to have. Being rarer means that the Picasso Clownfish is also a little more pricey than your average variety, but due to each fishes uniqueness, they are definitely worth the extra bucks. It also means that getting the care of this fish correct is vitally important as it will prove to be expensive should you get it wrong! The name Clownfish is believed to come from the resemblance that these fish bear to circus clowns moving around the big top ring in a comical manner. Picasso has sprung from the artist and refers to the colorful abstract markings that you would also see in the great artist’s paintings. A generally peaceful and friendly fish that will become familiar with and react to the surrounding people, the Clownfish can be a delightful addition to any aquarium and is certainly a popular one. This may, of course, be partially due to its appearance in a Disney film but also has to be because of its bright, striking colors and relative ease to keep. Interestingly, all Clownfish are born male but have the ability to become female. Only one living in any group, however, will do this as the hierarchy of Clownfish is built on one dominant female and a group of lesser males. Once a Clownfish has become female, it cannot go back to being male. In size and shape, the Picasso Clownfish is very similar to any other variety of this species. The only difference being that the Picasso usually tops out at around three inches whereas other varieties grow a little bigger. The body shape is still fairly oval, however, with eyes set off just to the side. Unlike many fish the Picasso has two dorsal fins, the first of which is known as the spiny dorsal and the second is known as the soft. All the Picassos fins have a scallop-like appearance, especially the pelvic ones, and are commonly edged in black. The tail fin is also unlike most fishes which appear delicate and graceful when they are swimming. The Picassos rather resemble the rudder of a boat. Color and pattern wise the Picasso displays the usual vibrant orange, darkest black, and whitest of whites that most Clownfish are graced with. The Picasso, however, is unusual in that the amount of white is much greater than in other varieties and the patterns are completely unique. Striping will be odd on the Picasso and markings will vary greatly with many not having stripes at all but rather patches of color. It is worth noting here that Picasso Clownfish are graded on the amount of white coloring they have and their markings. Premium grade Picasso’s will have larger amounts of white and more oddities. Some have even been known to be completely white, and these are known as platinum. Premium Picasso’s fetch a higher price than standard Picasso Clownfish. A grade A Picasso is said to have the white stripe connecting the main body to the rear stripe. Or is it a way to simply charge more for a fish? I’m not 100% Convinced a fish can and should be graded. What one person likes may not be what someone else likes. Where do Picasso Clownfish come from? Picasso Clownfish occur naturally only in the Solomon Islands and Papua New Guinea but are still extremely rarely found there. This is especially true since we humans have destroyed 15 – 30% of the worlds coral reef. Luckily, all is not lost though as breeding programs have been set up for this wonderful Clownfish and they now supply most of the fish keeping industry with Picasso’s. ORA is a fine example of Picasso Clownfish breeding which began in 2004 when they collected a male from the Solomon Islands. From there they bred that male with a female Onyx Clownfish and the breeding program was born. They have since added more wild caught to their collection but their dream of producing thousands of Picasso specimens a year has not quite come to fruition. 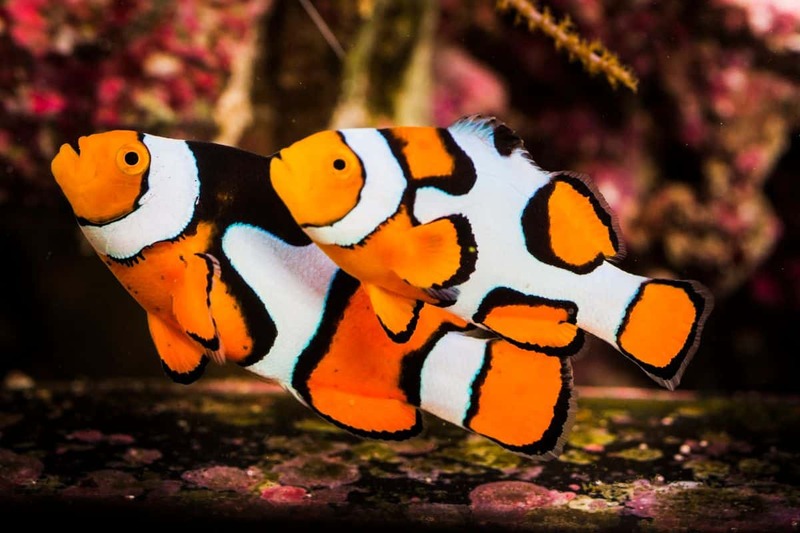 The majority of Clownfish born, even to Picasso parents, are of the common markings and colors. Picasso Clownfish are they peaceful or aggressive? Picasso Clownfish are a peaceful species in general with the exception of when they are guiding their eggs or home in an anemone. At this time they have been known to attack both other fish and hands that may be performing tank maintenance. Usually, however, the Picasso Clownfish is extremely friendly and a truly engaging fish. Not only will they follow you as you walk by their aquarium but they will do it in an endearing way. Picasso’s do not swim like other fish, rather they tend to waddle slowly making them look like a pet dog that is pleased and excited to greet you! They may also beg for food, swimming to the top of their aquarium in an attempt to grab your attention. In their natural habitat Clownfish, including the Picasso, are known to ‘chatter’ amongst themselves. This is usually done to warn others in their group of approaching predators and consists of five clicking sounds per minute. It is not known how they produce these sounds but they have also been known to make them in the home aquarium. Best kept in pairs due to their propensity to fight in larger groups, Picasso’s have a strict hierarchy where the female is definitely in charge. As previously stated all Clownfish are born male with one growing faster than the rest and metamorphosing into a female. The male and female will then bond with the male submitting by turning on its side and shaking. This appears like the male is having some kind of spasm. Once bonded they will be a pair for life although should one die they will accept another mate. Should it be the female that dies the remaining male will become female. With regard to other species of fish, Picasso Clownfish tend to be unbothered and oblivious to their presence. They have little or no interest in anything other than what is in their immediate vicinity and that vicinity is usually small. Picasso’s are not massive swimmers tending only to swim from top to bottom of the aquarium directly above their homes. As with any other species of fish you should always ensure you have researched and provided a correctly set up aquarium before you purchase a Picasso Clownfish. The minimum size tank recommended for Picasso’s is 30 gallons and the water parameters should be a temperature of 72 – 78℉ (22 – 26℃), pH of between 8.1 and 8.4, dKH 8 – 12 and sg 1.020 to 1.025. The tank should also be fully cycled and of course saltwater. 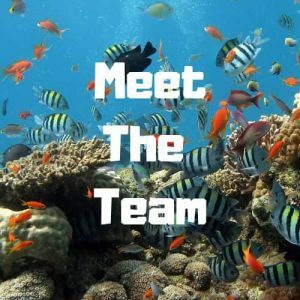 Decor-wise, Picasso’s are fully reef compatible and do well in aquariums that are fish only, community, slightly aggressive and have live rock. They also, as you may already be aware, love anemones. Picassos are known to be particularly fond of the genus Heteractis and Stichodactyla and pairing them with these is simple but can take time. First ensure that you have a happy anemone by keeping it in a clean and stable system, feeding it and providing strong light. Then simply leave your Picasso to finding it, which they will. Trying to force this meeting and attachment is not recommended as it can stress your Picasso’s out to the point of killing them. 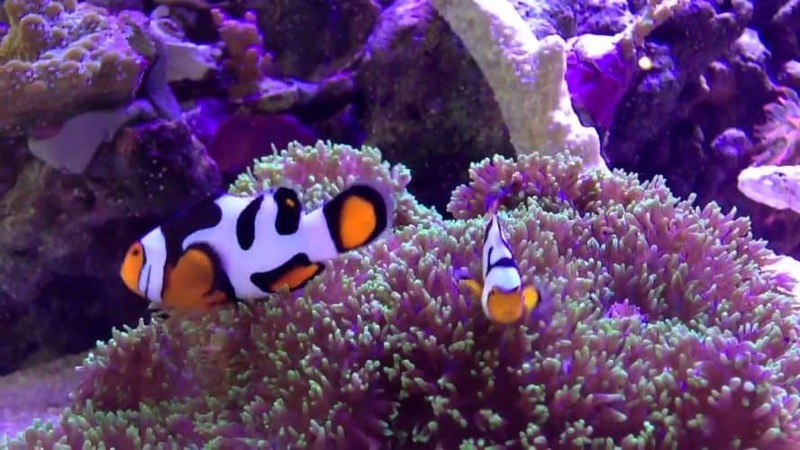 When choosing your Picasso Clownfish it is best to buy specimens that have been captive bred as the survival rates are higher and they are easier to acclimate. Usual purchase size is around ¾ – 1 ¼ inch when they are aged approximately 7 – 8 months. Picasso’s of this age are usually not fully developed with regard to the black coloration which will continue to develop into adulthood. When acclimating a Picasso Clownfish it is best to use the drip method as this will ensure they do not go into shock. To do this, place the Picasso and its bag water into a clean bucket and using a drip line slowly drip tank water in. This process should take around 30 minutes and triple the amount of water in the bucket. Once this is complete you can then carefully net your Clownfish and place them in the waiting aquarium. Do not pour the bucket water into the aquarium as it will contain copper and other unwanted substances. Once in the aquarium, you may find that your Picasso Clownfish go into hiding for a couple of days. This is nothing to worry about and perfectly normal behavior for these fish. Just monitor them for any signs of distress and offer them food when they eventually do come out. Aquarium maintenance should be performed on a weekly basis with a 25% water change and cleaning. You may also want to add scavengers to your Picasso’s aquarium to help you out with this in between. Failing to keep up with your water maintenance schedule could result in your Picasso falling ill. Common ailments include ich and fin rot which are both more often than not caused by poor water quality. What do Picasso Clownfish eat? As omnivores, Picasso Clownfish are not fussy eaters who in their natural habitat feast on crustaceans such as copepods, amphipods, algae, and polychaete worms. In captivity, however, they should be offered a dietary mix of live, frozen and dried. Seaweed sheets are a favorite of Picasso Clownfish, it may take them some time to starting eating it but once they do they love it. I buy mine from Chewy.com as they are inexpensive and offer quick delivery. Suitable foods for Picasso’s include marine flake food,mysis, spirulina flakes, marine pellets, brine shrimp and black worm. Preferably they should be fed once a day but alternate days will suffice. It should be noted, however, that not feeding daily will result in the slower growth of a fairly fast-growing species. We use color enhancing marine flake food from Chewy.com. This is perfect for Picasso Clownfish to bring out their amazing color patterns. Differentiating between a male and female Picasso Clownfish is a piece of cake as simply one is bigger than the other! Do not be fooled though by thinking that the male will be the bigger of the two as this is not the case. The female Picasso Clownfish is bigger and also far more dominant than the male. As mentioned previously Clownfish are all born male with one turning female and becoming dominant. When this happens the female and the male will then bond within a few days. Please note that on rare occasions Clownfish may never bond although there is no reason known for this exception to the rule. Once bonded Picasso Clownfish will spawn as often as once a month and have no issues with doing so in a community aquarium. They are definitely one of the easiest fish species to breed. It is, however, much easier to spawn them in a separate tank as the eggs need to be removed shortly after and this is easier when controlled. To purposely breed you will need a small aquarium with something like a clay pot or plate for the female Picasso to lay her eggs on. Feed both parents up before attempting breeding by feeding them at least three times a day. Once fed up and strong and healthy move the parents to be into the spawning aquarium. Once they have spawned, Picasso’s can lay between 300 and 600 eggs, you will need to move the eggs to a hatching tank. The water in this tank should be as pristine as possible. Moving the eggs should be done quickly and without hesitation to ensure they are out of water for as short a time as possible. The time period between laying and hatching will be somewhere between six and eleven days and most likely to occur in the dark. Interestingly bonded Picasso pairs eggs will hatch after the same number of days every time they spawn. You will need to ensure that there is a bubbler running over the eggs now to ensure that they hatch successfully. Once hatched the larvae can survive overnight on their egg sacs but are best moved to a new aquarium within two to three days. The water in this aquarium should be turned a dark green shade with liquid algae and have a light that is angled to provide the aquarium with both dark and light areas. Rotifer should also be added to the tank for the larvae to feed on. Over the next ten days a constant supply of food should be given including introducing dry food ground up on day three, and baby brine shrimp on day five. When the larvae start eating a good supply of dry food, the rotifer feeding should be stopped. With all the food being fed at this stage daily maintenance of the aquarium is also essential. Around day ten the larvae will metamorphosis into Clownfish as long as they are strong and healthy enough to do so. You need to ensure this is the case by faithfully maintaining a good feeding and maintenance program up to this point. On day twenty you should move the baby Clownfish to a larger grow out aquarium. Bear in mind that if you breed Clownfish you are going to end up with lots and lots of babies and will need a plan of what you are going to do with them all. Selling them is a good option but you need to be aware that very few, if any, of your newly hatched Clownfish, which you will notice I have not referred to as Picasso’s, will actually be Picasso’s! Do Picasso Clownfish make good tank mates? Picasso Clownfish make excellent tank mates for most community fish including damselfish, tangs, wrasses, blennies, angelfish, gobies and Dartfish. They should not, however, be placed with large carnivores such as groupers, lionfish, snappers, triggers, and eels! Other varieties of Clownfish also do not make good tank mates for Picasso’s unless you have an exceptionally large tank. It has then been known for different species to bond and even mate. In a smaller tank that will not be the result and they will more than likely fight. The same goes for placing multiples of more than two Picasso’s in the same tank. There is absolutely no doubting that the Picasso Clownfish is a great saltwater species for both beginners and experts alike. They are vibrant, friendly, easy to care for and breed with very little trouble. You can also keep them in a variety of habitats and with a good range of other fish. They can, however, be a little on the pricey side due to their rare markings and coloring. You may also not know on the purchase, due to how they develop, exactly what markings you are going to get. In my opinion, though, that is part of the appeal of this species and watching them become orange, black and white beauties is all part of the fun they bring!